Andrea L Jester, MD, Joshua A Waters, MD, Michael J Guzman, MD, Bruce Robb, MD, Don L Selzer, MD, Virgilio V George, MD. Department of Surgery, Indiana University School of Medicine. INTRODUCTION: Single port laparoscopic right colectomy (SPLRC) is emerging as a surgical technique to treat malignant and benign diseases of the right colon as an alternative to standard laparoscopy in an effort to reduce surgical morbidity and trauma. To date, there are a limited number of case series and case reports of SPLRC; furthermore, there are no data reviewing the safety and efficacy of SPLRC at a Veterans Affairs hospital with high morbidity patients. Here we review our initial experience with SPLRC at the Roudebush Veterans Affairs Hospital in Indianapolis, Indiana. METHODS: A retrospective analysis of prospectively collected data was performed of patients who underwent a SPLRC for benign or malignant disease at the Roudebush VA Hospital in Indianapolis, IN between July 2009 and September 2010. Data regarding patient demographics, disease process, intraoperative parameters and short-term post-operative outcomes were analyzed. RESULTS: Twenty-seven male patients underwent a SPLRC with a mean age of 67 years (range, 52-82). The mean BMI was 31 with a range of 20-41. The indication for a right colectomy was malignancy in 15 cases (55 %) or large polyps that were not able to be retrieved via colonoscopy in 12 cases (44 %). The ASA of the patients ranged from 2-4 with a median ASA score of 3. Four of the patients had an ASA score of 4. There were no intraoperative complications, and there were no conversions to standard laparoscopy or open surgery. The mean operative time was 105 ± 28 minutes, and the mean estimated blood loss documented was 50 ml ± 35 ml. Five patients (19%) experienced a post-operative complication. Two patients experienced a prolonged ileus lasting 6 and 10 days which resolved with conservative management. There was one incidence of post-operative hemorrhage that required re-operation—the patient recovered and was discharged on post-operative day 6. There was one case of post-operative superficial wound infection and one case of pelvic abscess requiring percutaneous drainage. There was no 30 day mortality. For the subset of patients with malignant disease, the mean specimen length was 24.6 cm (range, 12-35.7 cm), mean number of lymph nodes harvested in the specimen was 19 (range, 10-29), and one specimen with a positive radial margin. All distal and proximal margins were negative. Lastly, the amount of time until return of bowel function was 3.43 ± 2.22 days, and the mean hospital stay was 5.64 ± 5.6 days. 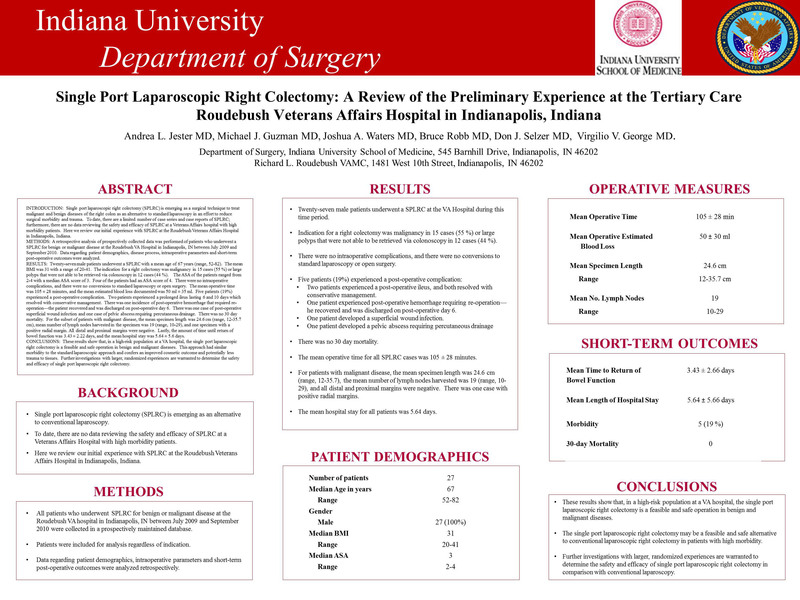 CONCLUSIONS: These results show that, in a high-risk population at a VA hospital, the single port laparoscopic right colectomy is a feasible and safe operation in benign and malignant diseases. This approach had similar morbidity to the standard laparoscopic approach and confers an improved cosmetic outcome and potentially less trauma to tissues. Further investigations with larger, randomized experiences are warranted to determine the safety and efficacy of single port laparoscopic right colectomy.